There are many prophets in the Bible. Getting to know a few of them can help you understand the message of God’s Word. Knowing when they lived also helps with knowing the chronology of events in the Bible. Here are seven prophets and the basics of their messages. The first four are called the major prophets. This is because of the length of their books, not because their message was more important than the others. 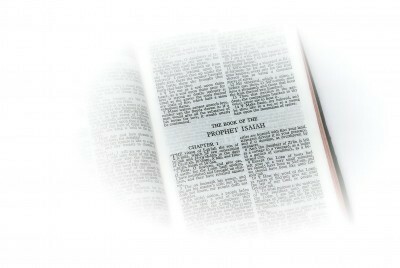 They wrote books bearing their names, as well as Jeremiah having written the book of Lamentations. Two of the other three prophets are minor prophets and then I included a New Testament prophet, the Apostle John. Isaiah prophesied to the Jews in Judea concerning the coming Messiah. Or, more generally that salvation comes from God. The word salvation is used 26 times in the book. That may not seem like a large number for such a long book, but the word is only used 7 times by all the other books of prophesy combined. The book of Isaiah is 66 chapters long. The Bible is made up of 66 books. In Isaiah the first 39 chapters deal with the anticipated arrival of the Promised Messiah. There is also much talk about man’s need for salvation. This corresponds to the 39 books of the Old Testament. The last 27 chapters of Isaiah deal with the kingdom of Messiah and how God provides salvation through Him. This parallels nicely with the 27 books of the New Testament and their message. The book of Isaiah is 66 chapters long. Isaiah wrote between 740 and 680 BC. This was during the final years of King Uzziah, the whole reigns of Jotham, Ahaz and Hezekiah. Jeremiah prophesied to the Jews in Judea and in captivity. Jeremiah worked during the years that the Babylonian captivity started. The kings in Judah at that time were Josiah, Jehoahaz, Jehoiakim, Jehoiachin, Zedekiah. Jeremiah wrote between 627 and 585 BC. Other prophets who wrote during his time were Zephaniah, Habakkuk, Ezekiel and Daniel. Jeremiah is called the weeping prophet and the prophet of loneliness. He wept often in his writings (Jeremiah 9:1; 13:17). He was also told not to take a wife or have children (Jeremiah 16:2). While Jeremiah prophesied of future things, he embodied another great aspect of biblical prophets: he preached against the sins of the people. He preached of coming judgment and a message of repentance. Some of the atrocities of the people he loved included human sacrifice of their own children to foreign gods (Jeremiah 7:30-34). Jeremiah wrote the book that bears his name as well as the book of Lamentations. Though Jeremiah is not named within Lamentations as the author, there are various evidences that he was the writer. From early translations of the book it was assumed by the scholars and scribes that he was the author. There is a great similarity in the writing styles of the books of Jeremiah and Lamentations. Also, many of the events were eyewitness accounts and we know that Jeremiah lived during the events portrayed in the book. While Jeremiah was written about the wars and coming destruction of Jerusalem, the main focus of the book of Lamentations is the actual destruction of his beloved city. The book seems to have been written very shortly after those events. Lamentations is the weeping and mourning because of the judgment of his people that he warned of in the book of Jeremiah. Ezekiel prophesied during the reigns of Zedekiah (King of Judah) and the Babylonian King Nebuchadnezzar. The prophet Ezekiel’s name means “God strengthens” or “strengthened by God.” His prophecy greatly focused on temple worship and the priesthood. Throughout the book there is emphasis on the necessity of punishment for sin so that God’s grace can be seen. There would be a time when God would restore a small remnant of His people to Himself. Ezekiel concerned himself with reminding the people of their sins which brought judgment, but that God would keep His covenant with the people of Israel. The first 24 chapters of the book were written before the fall of Jerusalem. Coming judgment on the city of Jerusalem and the temple was sure. The last 24 concern the coming restoration and the millennial kingdom of God. In fact, “restoration” is one of the key words seen in the book. God wanted to restore His people so that they “shall know that I am the Lord” (a phrase which occurs 63 times in the book). Isaiah, Jeremiah and Zechariah speak of Christ as a Branch (Isaiah 11:1; Jeremiah 23:5; 33:15; Zechariah 3:8; 6:12). Ezekiel calls Christ a twig planted on a high mountain which will spring up as a strong cedar bringing salvation to many (Ezekiel 17:22-24). Probably one of the better known prophets is Daniel. Though we call him a prophet today, he did not hold an official position as a prophet. Therefore, in the Hebrew Bible he is classified in the books of poetry, or the books of writings. We know much about his personal life and the story of him being thrown into a den of lions. What many may not realize is that he was an old man by the time that event took place. Certainly he was as old as 80 and maybe up to 90 years old. The book was written to encourage the exiled Jews. The theme of the book is the sovereignty of God; that He will judge the wickedness of the world and restore His people according to His promises. There are various stories and prophesies within the book. Probably the greatest that is studied intently today is the prophecy in chapter 9 known as Daniel’s 70 weeks. This is a prophecy (in the sense of seeing into the future) that foretells many things leading up to the coming of Messiah, His birth, the destruction of Jerusalem and beyond. There are many different interpretations for this prophecy. Of the 70 weeks, 69 have been fulfilled. The final week of Daniel will be fulfilled during the tribulation. The story of Jonah is self-incriminating. It is presumed to have been written by Jonah and covers a very short period of time. Jonah lived during the reign of Jeroboam II which spanned the years 786-746 BC. Jonah was sent to prophesy to Nineveh. The prophecy centers on the fact that God will provide forgiveness to other nations if they will repent and turn to Him. The story surrounding the prophecy is that Jonah is told by God to go to Nineveh and preach a message of repentance. Jonah flees the other direction. Because of a storm, he is cast into the sea. Jonah spends three days in the belly of a great fish (which Jesus calls a whale in Matthew 12:40). After he repents, he then takes the message of repentance to the large city of Nineveh. The response of the Ninevites is tremendous. However, in contrast, Jonah’s response is deplorable. He is sad because of the repentance of his country’s enemies. The people of Nineveh repented and God spared them from His judgment. Jonah had expected them to blow off his message and that Jonah would get to witness their destruction. When God did not destroy them Jonah was disappointed. The book ends with Jonah getting a message from God. The message was that God wanted Jonah to ponder whether it was better for a city the size of Nineveh to be destroyed or that people could see the mercy of God. It is somewhat of an odd ending to such a book. We don’t know how Jonah responded. If he was the author of the book (which it is presumed he is), then why didn’t he try to justify his actions? I guess we are left hanging to make our own conclusions to God’s message. The book of Micah was written by the prophet of the same name. He is called a minor prophet (like Jonah) because his book is much shorter than the major prophetic books. The book was probably written between 735 and 700 BC (during the time of Isaiah). The nation of Israel had turned away from God. Micah’s message was one of judgment, but also of hope. If Israel would repent and turn to God, there would be mercy and hope for the nation. However, judgment was sure if there was no repentance. The problem was not that Israel refused to worship—they seemed to be completely caught up in religious ritual—the problem was that their worship was not directed towards God. They worshiped for the sake of ritual, not for the sake of God. God wanted faithful and humble living before Him, not outlandish worship directed elsewhere (Micah 6:8). Micah tells us where the Savior would be born (Micah 5:2). The book of Micah is typical of God’s message. God gives plenty of warning of His coming judgment. Yet, He also is ready to restore a people who will come to Him in repentance. The Apostle John was a prophet in the New Testament. John the Baptist was also a prophet. Even though John the Baptist brought a message of repentance or judgment in the New Testament, he is also considered the last Old Testament prophet since he prophesied before (and during) the ministry of Jesus Christ. However, our focus is on the prophecy of John the Apostle. Also known as, John the Revelator. John wrote the book of Revelation. This prophecy is all about the coming judgment and future millennial reign of Christ on the earth. John writes to seven actual churches in Asia Minor. He warns them of specific coming judgment. God brought these to pass historically, but there is also a prophetic interpretation that applies to the church age. After the message to the churches John is swept up to Heaven (interpreted as the rapture) to see the things which will come about in the future. The glory and power of Jesus Christ is revealed in the book. We start to see not only the slain Savior of the world, but the powerful King the Jews have sought since the time of Abraham. I trust that this brief introduction to various prophets will get you interested in studying the prophetic books of the Bible. The main message is repentance and forgiveness. God teaches this lesson in different ways at different times through different prophets. Each one of them is interesting and worthy of your study time. David, I always enjoy your articles. I find them to be very Biblical. Today I especially enjoyed reading about Jonah. My pastor once covered the Book of Jonah and I find it to be a fascinating book. It shows God’s faithfulness to all humanity and His willingness to save us all, as long as we repent. No matter who you are or what you have done, if you truly repent and surrender to God, He will take care of you. Jonah’s response was indeed deplorable, I can’t say I would be above something similar. God bless you. Previous post: Why Did God Send Jesus To Die? Was It Necessary?